Marquetry is the art and craft of applying pieces of veneer to a structure to form decorative patterns, designs or pictures. The technique became famous and widely used when it began being applied to case and even seat furniture, as well as decorative small objects with smooth surfaces that were able to be veneered, or to freestanding pictorial panels, that can be appreciated in their own right. This marquetry technique was adopted by the French from the stone mosaic technique, known as Pietra Dura, which originated from medieval Florence, Italy. The technique that I am using in this article came from the inlay work of almost the same period, which was handed down by the Italian masters. Due to the development of woodworking tools and technology, the once popular large shoulder knife became a smaller tool and saw cut veneer changed its thickness from 5mm to 0.8mm and became sliced. The tool I am using is rather small and has to be held almost like a pencil. This knife is self-made using a bit of 0.5mm-thick HSS steel for a blade and a suitable piece of wood for the handle. The blade is sharpened on a waterstone to create a flat, pointed knife edge with a bevel on both sides. The steeper the angle of the blade, the tighter the curves it will cut. While being very manoeuvrable it does make the tip delicate and therefore has to be used carefully to avoid damaging it. 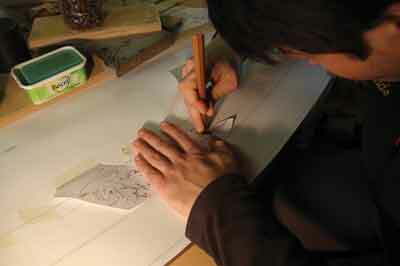 The blade is purposely kept short to avoid flexing and help to control the freehand nature of the work. 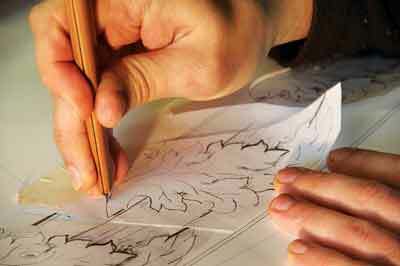 I start by attaching a drawing or an image onto the place where I am planning to insert a new element. 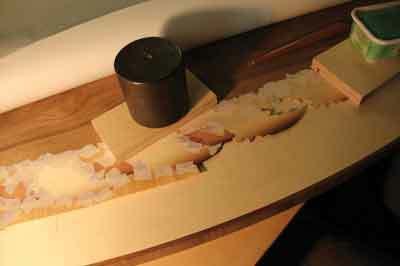 I use the marquetry knife for all cutting and marking. Following the marks, I begin by cutting the space for the new element, which is known as the 'window'. 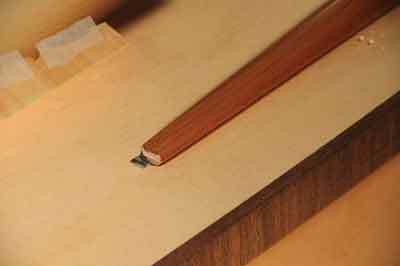 It is important to hold the knife perpendicular to the surface of the veneer and in line with the direction of the cut. Leaning over in either direction will often obscure the line you are cutting. 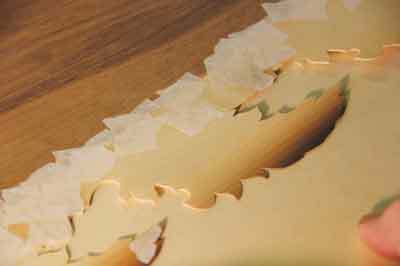 Keeping the knife as close to 90° as possible results in crisp edges to the veneers and minimises any gaps in the joint when the pieces are glued in place. As the term 'window' implies I start each new section of the design by placing the material to be cut - the inlay - under the surrounding material - the window - and choose how I want to see the grain pattern appear. Colour, grain direction and scale all have an effect on how the overall design will eventually look. For example, a linear grain pattern such as Douglas fir (Pseudotsuga menziesii) or zebrano (Microberlinia brazzavillensis) might be useful to emphasise architectural elements or driving rain. Tight-grained species such as pear (Pyrus communis) and boxwood (Buxus sempervirens) have little or no variation in pattern so are good for large areas and backgrounds. Grain pattern can also be used to suggest movement and textural layers that give the pattern a three-dimensional quality. As far as I know, there are no hard and fast rules or standard applications for doing this; just as each piece of veneer is unique so is the effect it will have on the pattern. Treating each component separately is the most effective way of building your picture. 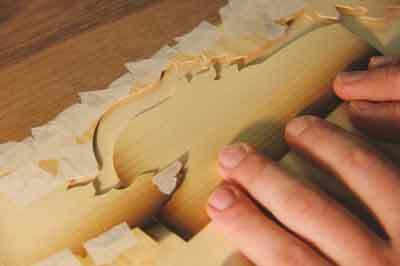 The fretsaw technique typically utilises a frame saw, which is known as a donkey. This is a French adaptation of an Italian stone mosaic working bench or space. It involves a pack of veneers taped together in a single bundle with a drawing of the pattern stencilled onto the top sheet. 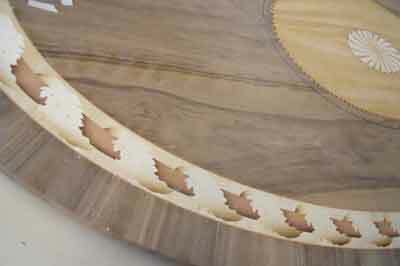 The veneers are cut at the same time and although this method is quicker than the window method, it doesn't allow the artist to make subtle adjustments to the orientation of the veneers. Holding my new piece of veneer as tight as possible beneath the window space, I first mark the shape with a single knife stroke keeping the knife upright and perpendicular to the edge of the window. This marking has to be very precise as once the two pieces are separated it is almost impossible to re-align them exactly for a second attempt. 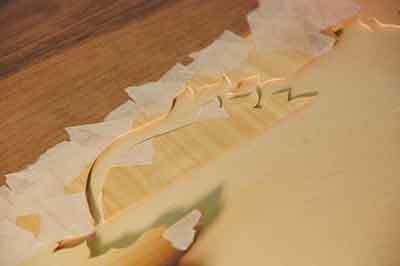 When the two pieces are cut you can then tape them in place with a low tack masking tape or specialist veneer tape. When complete, the entire panel can be glued to the substrate in a veneer press. 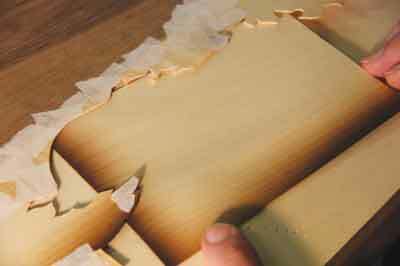 When the glue has dried, remove the masking tape with a scalpel or, in the case of the veneer tape, a damp piece of cloth will sometimes loosen the tape sufficiently for it to be peeled off by hand. Scraping and sanding the surface will complete the panel. Further detail can be added to your pattern by either engraving the surface of hard materials, such as bone or veining. For this project the veining or grooves were cut freehand using a Japanese double bevel knife. 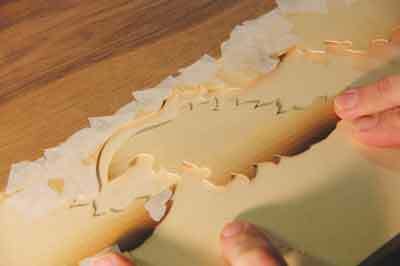 Following the general pattern of the acanthus leaf motif from the drawing, I cut the veins with a single stroke. Be confident with your technique and aim for a fluid stroke without stopping. 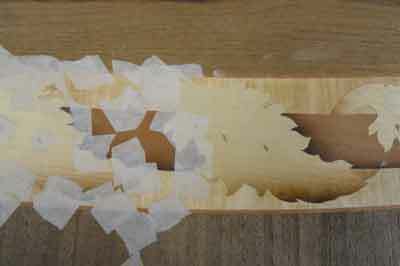 The knife cuts rather deep and in fact cuts right through the veneer into the substrate. 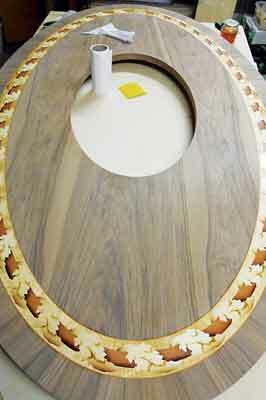 As it is bevelled on both sides and thicker than the marquetry knife, it creates deep 'V' shaped grooves that, when filled with a dark wax, adds to the picture-like quality of the inlay. 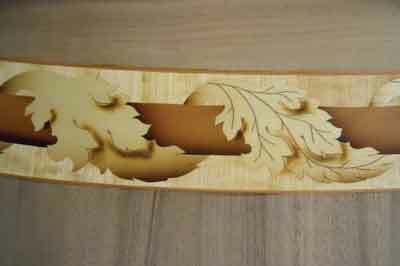 The pieces of veneer for the acanthus leaf and tulip had to be pre-cut to the correct size and shaded before being marked and cut to join the panel. 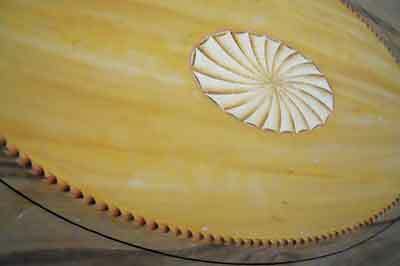 Shading is done in a traditional way using very fine sand, which is heated to a particular temperature - very hot. Here, pieces of pre-cut veneer are inserted into the sand for a calculated number of seconds, which helps to avoid the over-burning effect. By burning the veneer the wood becomes brittler and increases its difficulty to be cut. 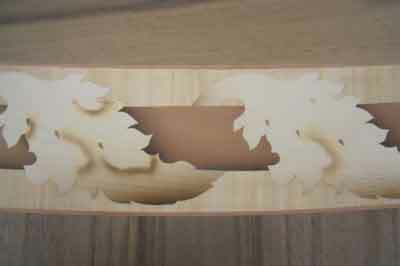 Unlike some complex techniques used in cabinetwork the window method of inlay does not require a template. For this project, every single piece was individually selected and cut by hand, using the marquetry knife. In total, I counted 146 tulips in the middle circle and 41 acanthus leaves on the border circle. Altogether, there are 450 separate pieces that make up this panel. 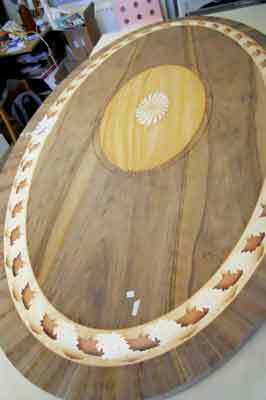 The benefit of using a marquetry knife for such a large project is the flexibility it allows. The knife is no larger than a pencil and there is no need to have a massive bandsaw-like machine or a donkey, neither of which are suitable for detailed work on the scale of this inlay project. The table was commissioned by the Royal & Ancient Club St Andrew, St Andrew, Fife, and a lot of work was put in to making it stand out as an important piece in the grand room. It had to reflect the shape of the room itself and all the decorative elements from the ceiling as well as those in the carpet. The middle oval space has been made into a display featuring a collection of valuable and important books belonging to the Club. The table was made by Sean Diggin, of Diggin Furniture Ltd, and the design of the acanthus leaf, tulips and the fan were made by me. The piece has been greatly admired and is used for special occasions and meetings of Club members. For more information about this technique or to see more works by Yuri, please visit his website.